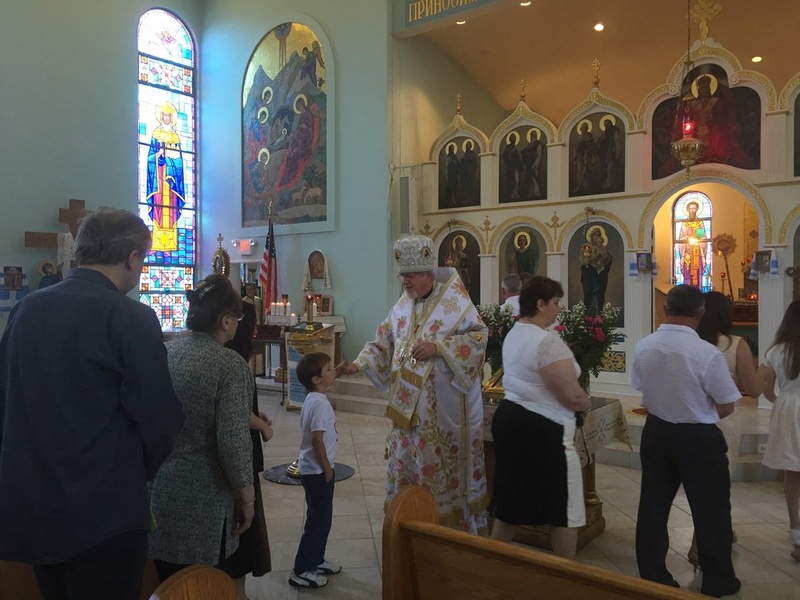 It was on Sunday afternoon, 25 August 2013, at St. Mary Protectress (Pokrova) parish, Philadelphia, PA – just a few hours after Divine Liturgy had been celebrated and the faithful members had departed to their homes – that TRAGEDY struck in the form of a fire caused by aging electrical wiring. The fire grew rapidly and spread to encompass the whole Church building and the parish social center and school. 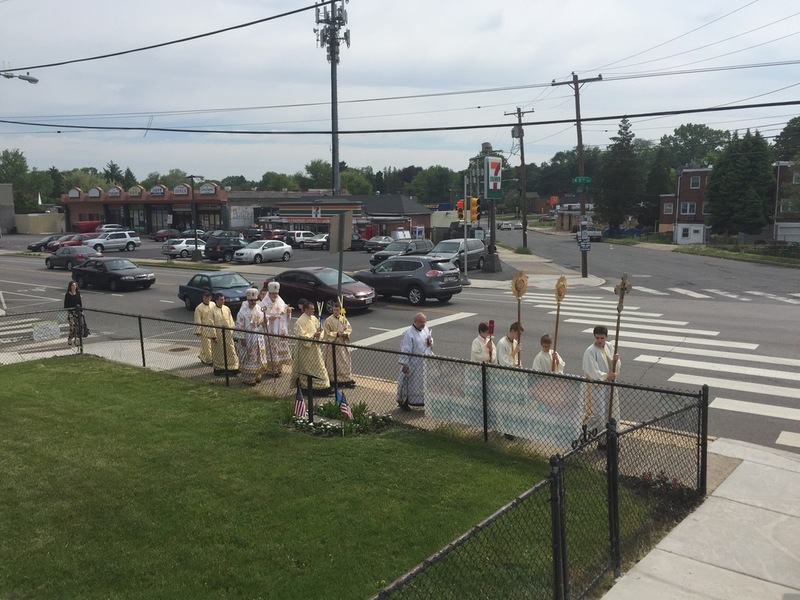 Parishioners, along with their priest, Fr. Volodymyr Khanas, began to gather to witness the horror. Fr. Taras Naumenko, of St. Vladimir Cathedral just a few miles away was also present and had informed Metropolitan Antony and Bishop Daniel about what was happening and by the time our hierarchs arrive an hour later to comfort the parish family, it was a five-alarm fire, meaning that five fire companies were working diligently to put an end to the fire. Unfortunately, the buildings were completely destroyed. At the conclusion of the day, all those who had witnessed what took place were convinced that everything within the church had been lost. The next day they all were astounded to learn that so much had survived the fire and the hundreds of thousands, if not millions, of gallons of water that had been poured into the structure. The most obvious surviving item was seen through the partial walls that remained standing. It was the iconostas that stood now in the open air, heavily damaged, but restorable. The tabernacle from the Holy Altar was minimally damaged along with several other liturgical items. Among the most moving items retrieved were a pair of wedding rings that had been blessed that day and remained on the Altar until the wedding that was to take place the following Saturday. These and many other items were removed by firemen and later parish members and moved to safe storage until the time comes for restoration to begin. A period of confusion and mourning followed the tragedy with faithful members unable to comprehend such a loss and also beginning to comprehend the decisions that had to be made in the near future. Fr. 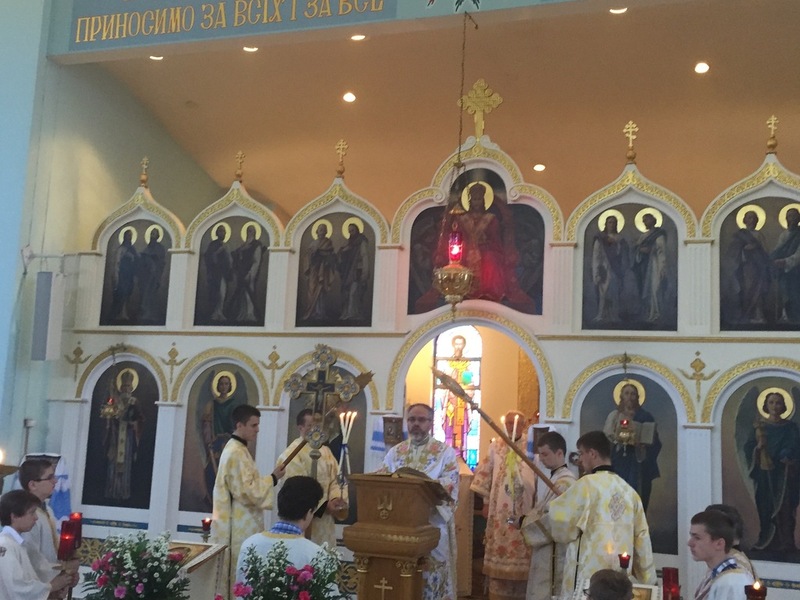 Naumenko and the Parish Board of St. Vladimir Cathedral invited the parish priest and parishioners to serve utilize the Cathedral for Divine Liturgy, fellowship gatherings and meetings, for as long as necessary to make the necessary decisions. 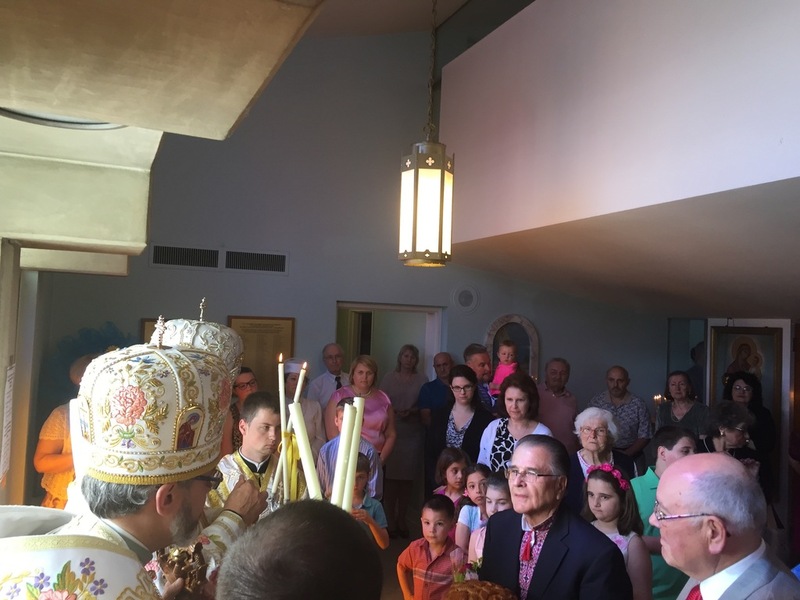 The primary decision to be made was about the future of the parish’s existence consisted of two alternatives – whether to unite with the Cathedral parish or to purchase/rent/build another church building so that Pokrova parish could continue its existence. It was decided to prepare a ballot to be received by all the parish members in good standing on the day of the fire, asking them to vote for the alternative they supported. 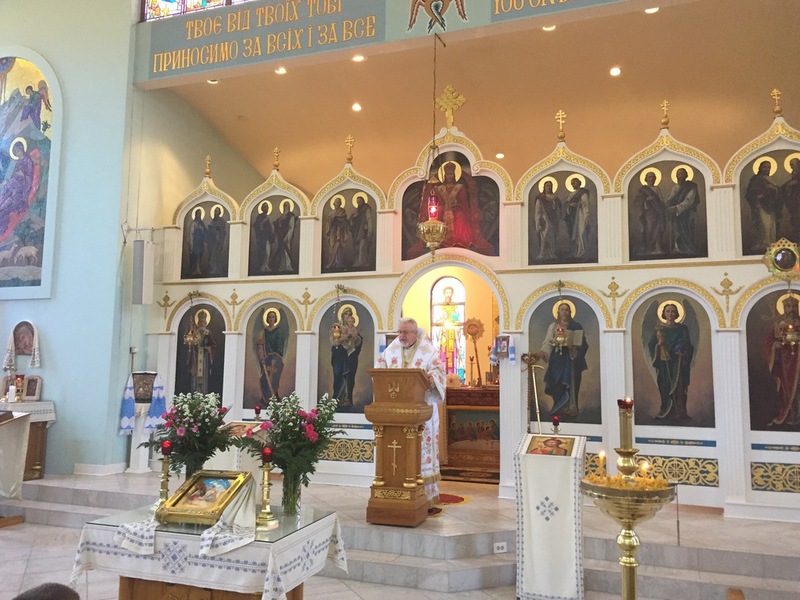 Two statements (arguments) were included with the ballot - one presented by supporters of uniting with the Cathedral and the other by supporters of continuing the existence of Pokrova parish. 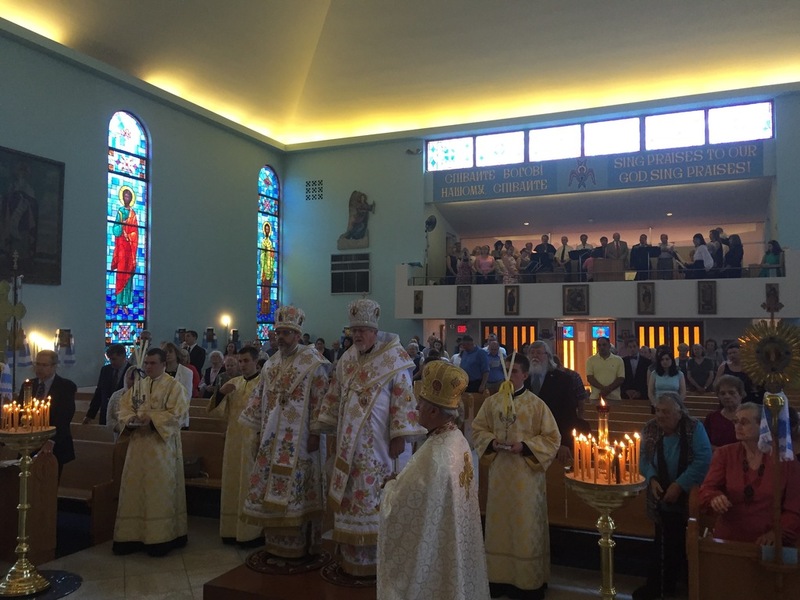 In March of 2014, the faithful gathered for the parish annual meeting with the presence of Metropolitan Antony, to whom all ballots had been sent and the ballots were opened and counted. 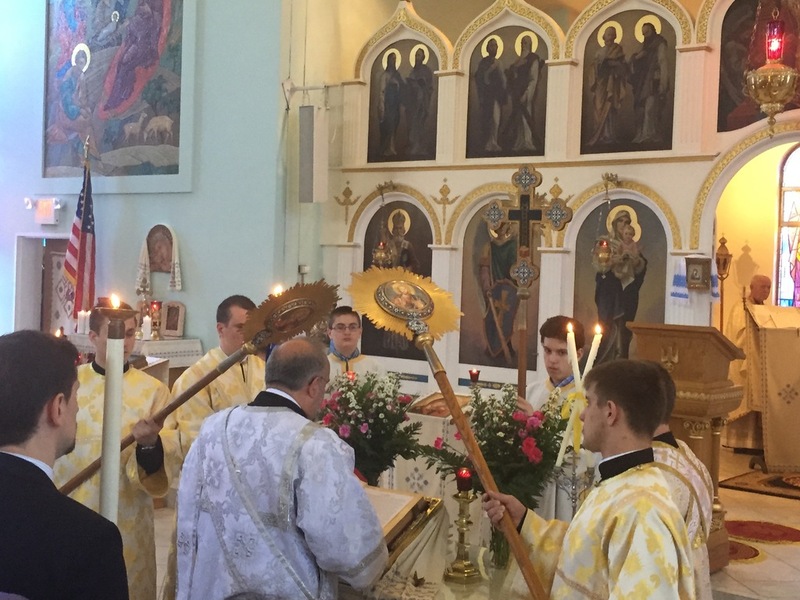 The decision was made to unite Pokrova parish with St. Vladimir Cathedral and a joint committee from both parishes was appointed to work out the details of the unification. This committee met on numerous occasions to discuss all matters pertinent thereto. 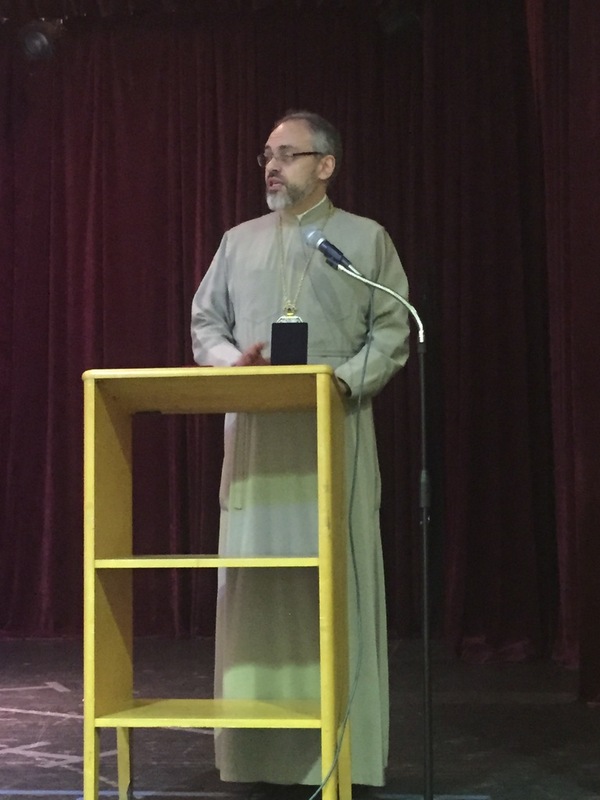 The discussions were not difficult because they were filled with an atmosphere of love and respect for the history of both parishes and the needs and desires of the faithful. The result of these discussions was a very brief “Unification Agreement” because the members of both committees acted purely in our Lord’s precepts of love and Orthodox Christian fellowship. This agreement was presented separately to and approved by parish membership meetings of both parishes. Serving on the unification committee were: His Eminence Metropolitan Antony, Chairman; Fr. Volodymyr Khanas; Fr. 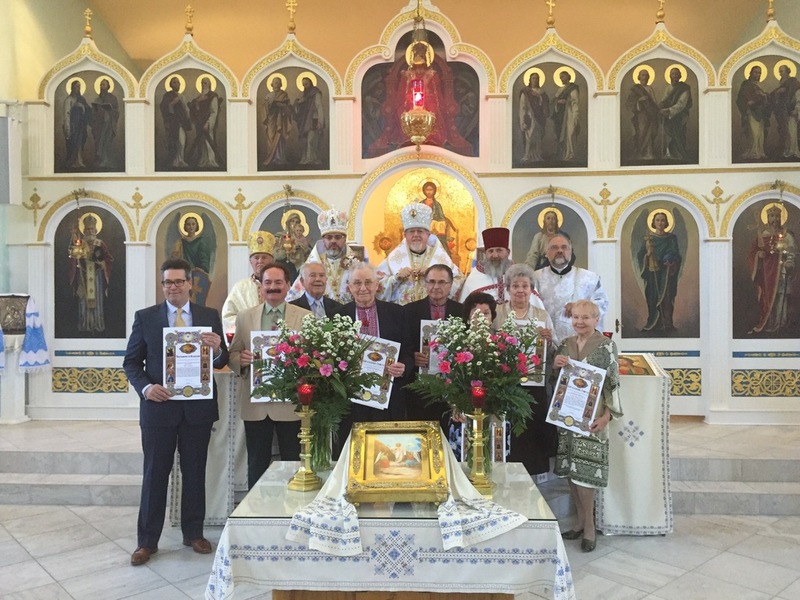 Taras Naumenko; Ivan Prasko, President of Pokrova Parish Board; Edward Zetick, President of St. Vladimir Parish Board; Petro Hursky, Natalia Klos and Stephen Hawras – Pokrova Parish; Andrew Passyn, Natalie Bilinsky, Mark Bohen and Vira Shapovalenko – St. Vladimir Cathedral. 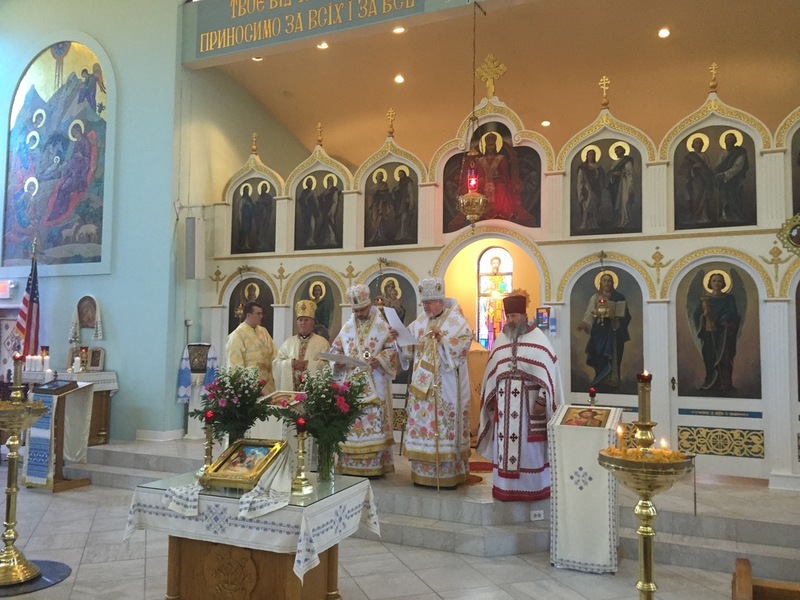 The committee set 17 May 2015 as the day of the official unification of the parish and asked the parish to invite both of our Church hierarchs, Metropolitan Antony and Bishop Daniel to join in the celebration. 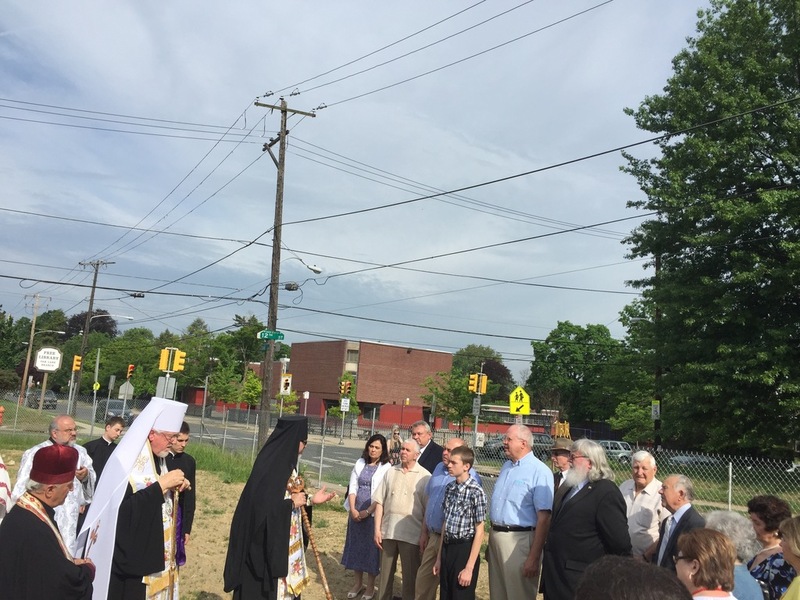 The long awaited day of unification finally arrived and began at the now vacant lots where Pokrova parish once stood. 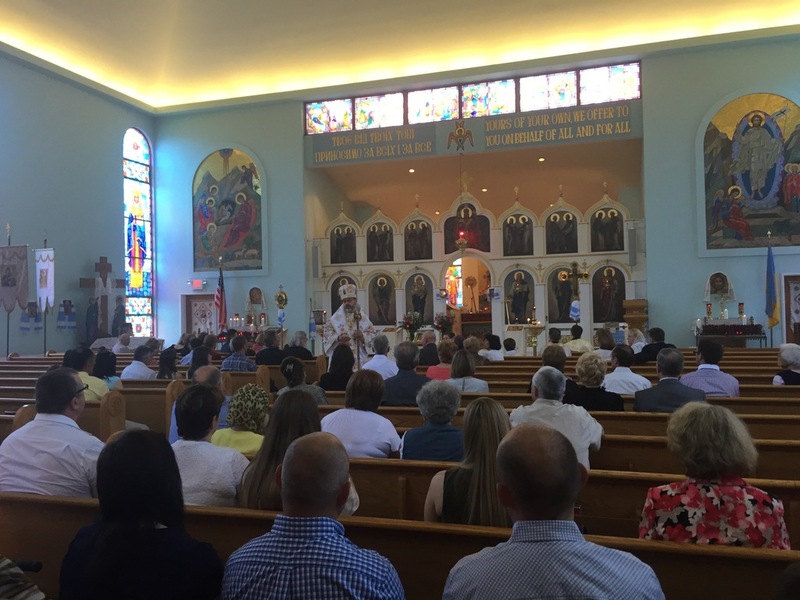 The faithful gathered at 9 a.m. prior to Divine Liturgy in St. Vladimir Cathedral to serve a Panakhida – Memorial Service remembering all the founders, benefactors, parish priests and members of Pokrova parish over the 65 years of her existence. 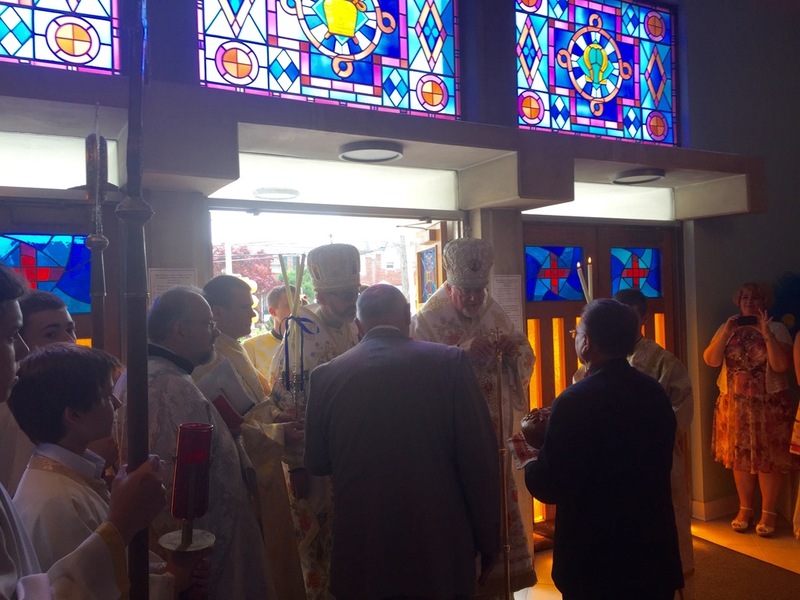 The four clergy serving Divine Liturgy a short time later remembered the five hundred individuals by name. 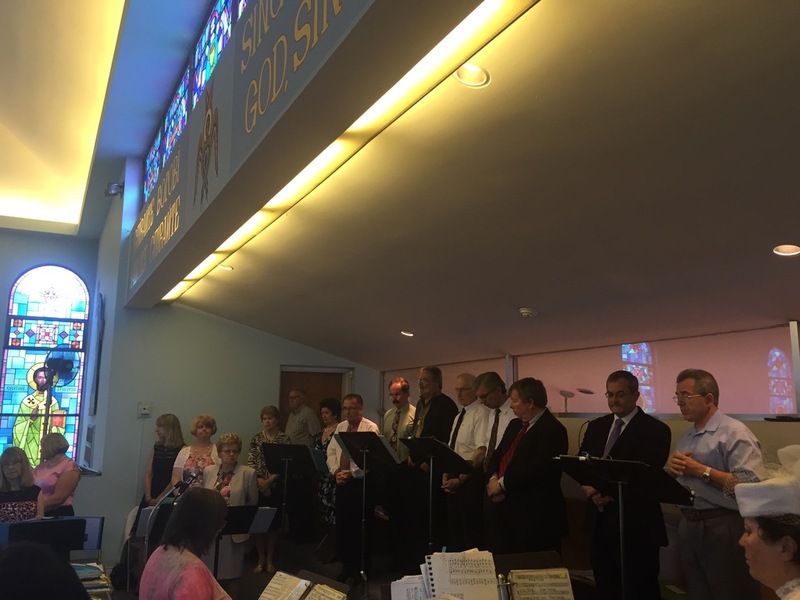 The Cathedral choir under the capable direction of Karen Ferraro sang the entire Liturgy in a truly spiritual and joyful expression of gratitude for God’s blessings upon the newly united parish. 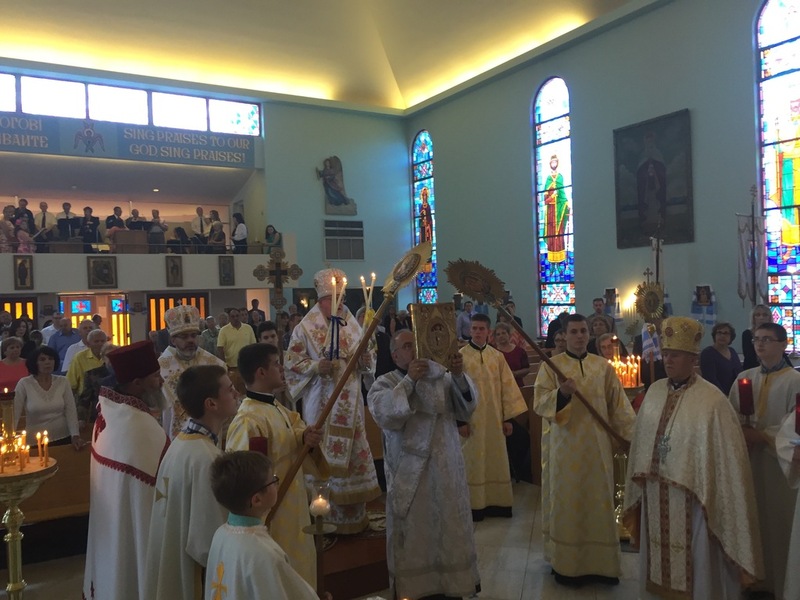 In his homily during Liturgy, Metropolitan Antony recalled the events that led up to the formal unification of the two parishes and declared the day as one that “the Lord had made…” and called the faithful to “…rejoice in it!” (Psalm 117) He stated that the Lord made the day through the efforts of Christian love exhibited by members of the unification committee and the membership of both parishes. 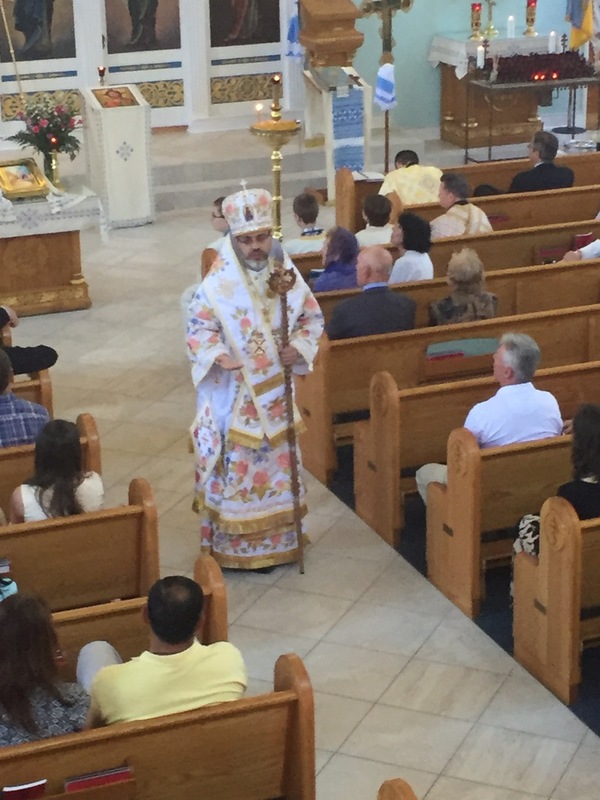 It is a day that enables all the faithful of the newly united parish to offer gratitude and praise to God for His abundant blessings on every step toward unity. His Eminence stated that the Lord, Who made this day, is the same Lord Who worked miracles throughout the Gospels, the same Lord that enabled the man born blind of the day’s Gospel reading to see for the first time in his life and to bear witness to Christ regardless of those who would not believe him. The Lord who made this day of unification is the same Lord, Who rose from the dead and made our own resurrection possible, destroying death by death and opening the gates of Heaven to all His faithful followers. He called upon all the faithful to work hard at building their faith in this Lord, Who makes all things possible. 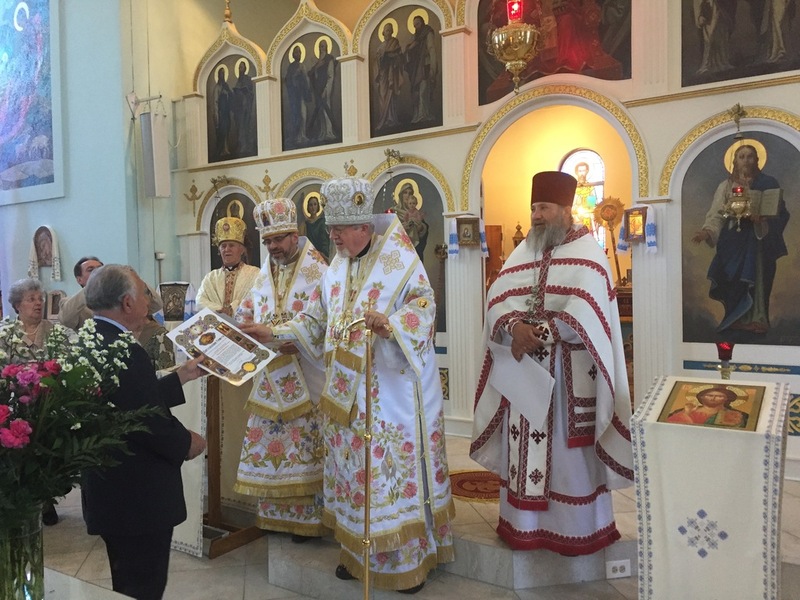 At the conclusion of the Divine Liturgy, special “Hramotas” – Certificates of Blessing – were made by Metropolitan Antony at the request of the Pokrova Parish Council to individual parish members for their contributions to the life of the parish through her years of existence. They included: Ivan Prasko, long serving President of the Parish Board and Bulletin Editor; Petro Hursky, long serving Secretary of the Parish Board Director of the Parish Choir; Ivan Sawchuk, long-serving parish Treasurer and maintenance director; Dr. Petro Kliuk, former parish Board President and present Vice-President; Paraskeva Prasko, long serving and present Treasurer of the parish board; Sophia Silin, long serving President of the Parish Sisterhood of St. Olga; Kyril Pasichnyk, long serving starosta of the parish; Maria Maliy, long serving care-taker and baker of the parish; Stanislava Korniuk, long serving care for the parish members who were ill and the planner of many parish events; Lesia Derevianko-Vibel, long serving Sisterhood member in the parish kitchen and Oksana Mandybur – long serving Sisterhood member in the parish kitchen. 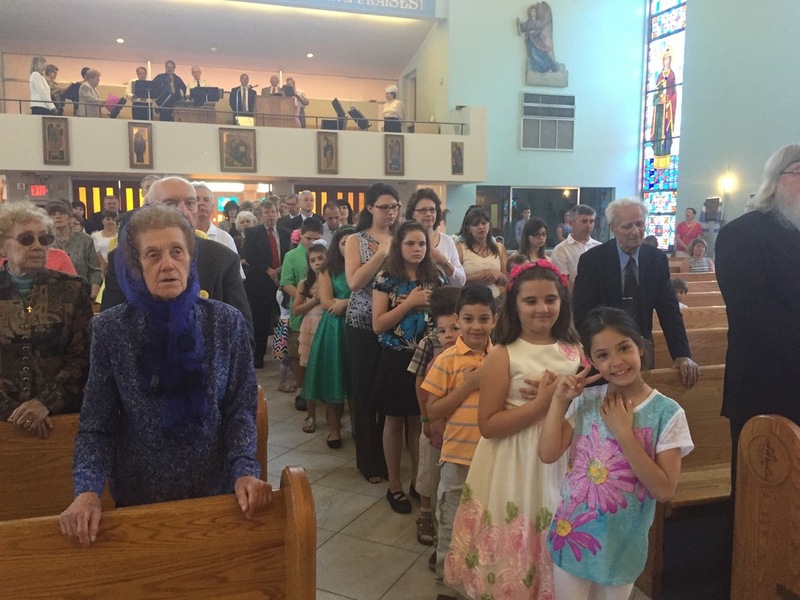 In addition, Hramotas were presented to all the members of the parish unification committee as listed above. 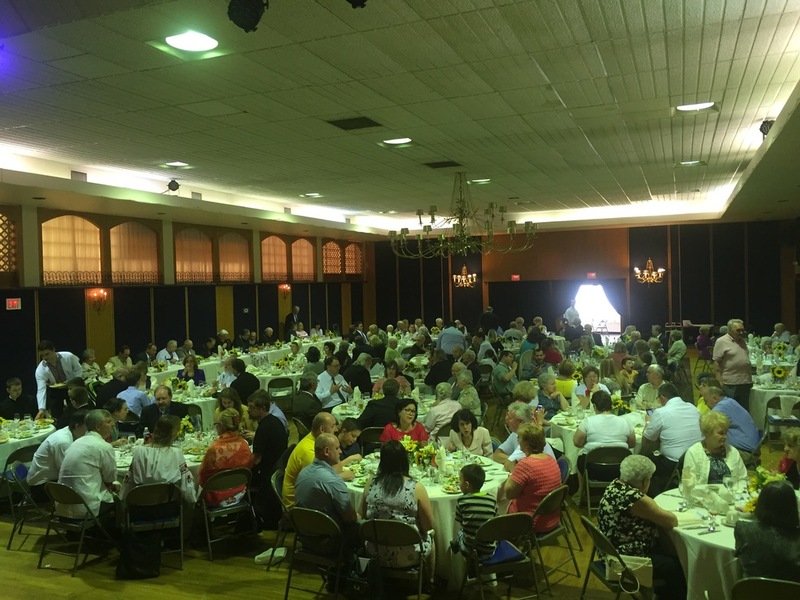 Following Divine Liturgy, the clergy and faithful gathered for a banquet at the Philadelphia Ukrainian Cultural Center. 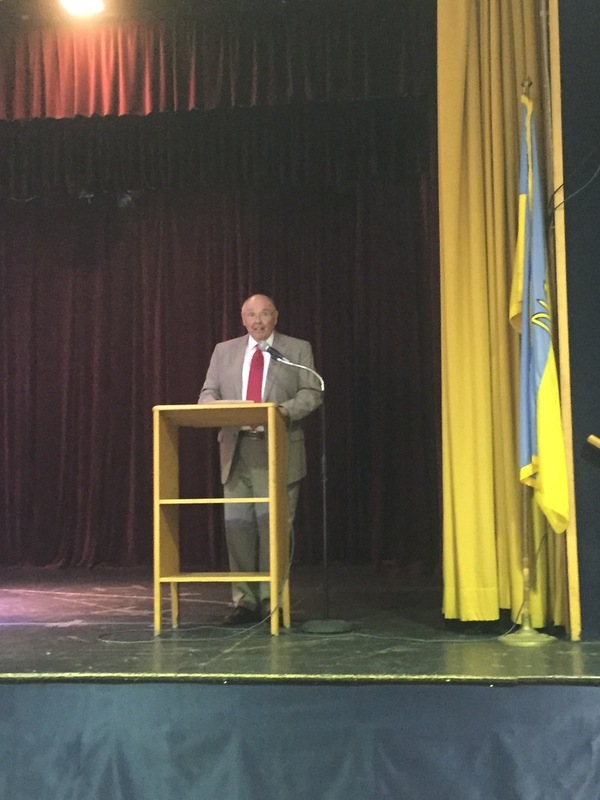 Ivan Prasko acted as the Master of Ceremonies for the program of the day. 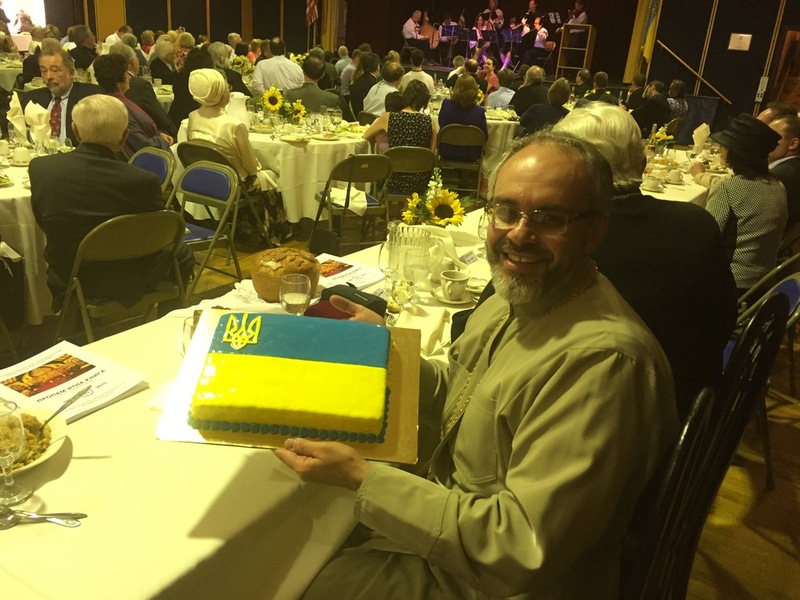 He introduced the guests at the head table and representatives from Ukrainian organizations and institutions joining in the celebration. 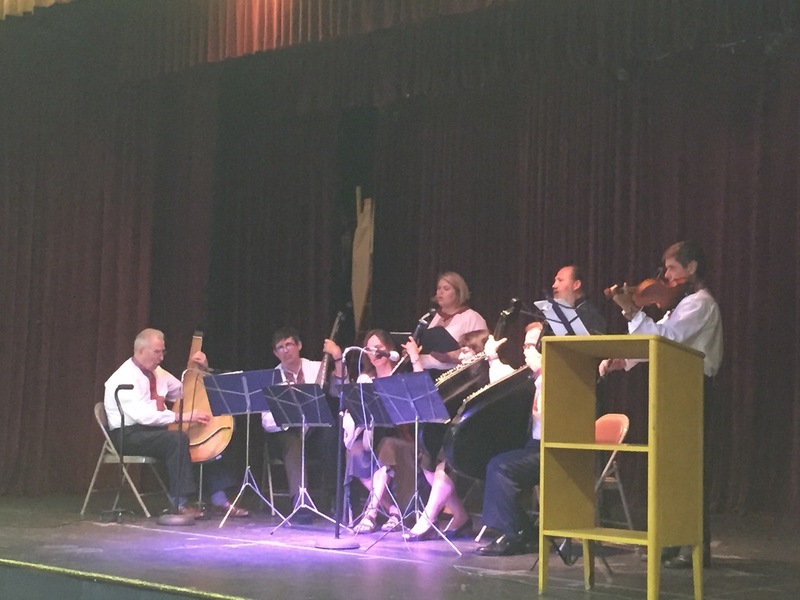 At the conclusion of meal service a beautiful cultural presentation – a bandura concert – was presented under the direction of Petro Hursky and supported by Ivan Prasko as lead bandurist and accompanied by the bandura students of Mr. Hursky. Fr. 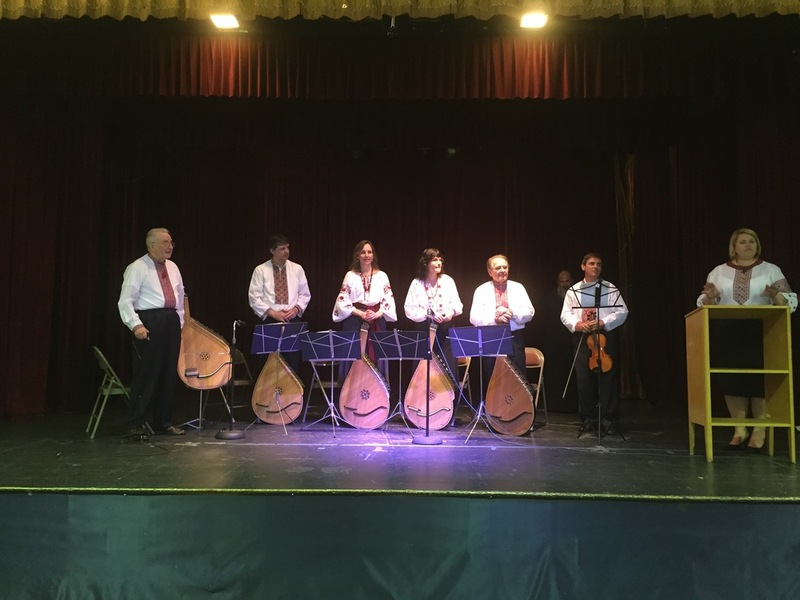 Taras and Panimatka Laura Naumenko joined with the bandura players in singing the songs of the concert. 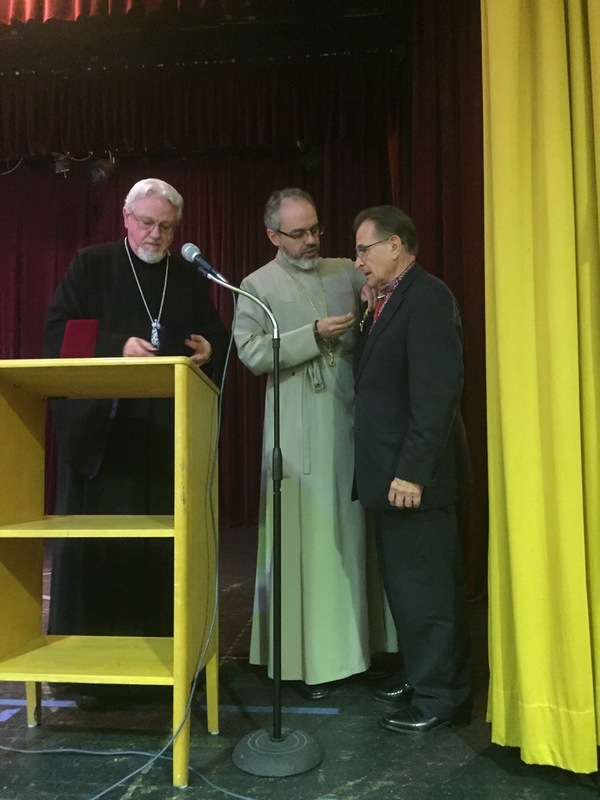 At the conclusion of the concert, to the surprise of the Master of Ceremonies, Metropolitan Antony and Bishop Daniel requested the microphone for a few special presentations. 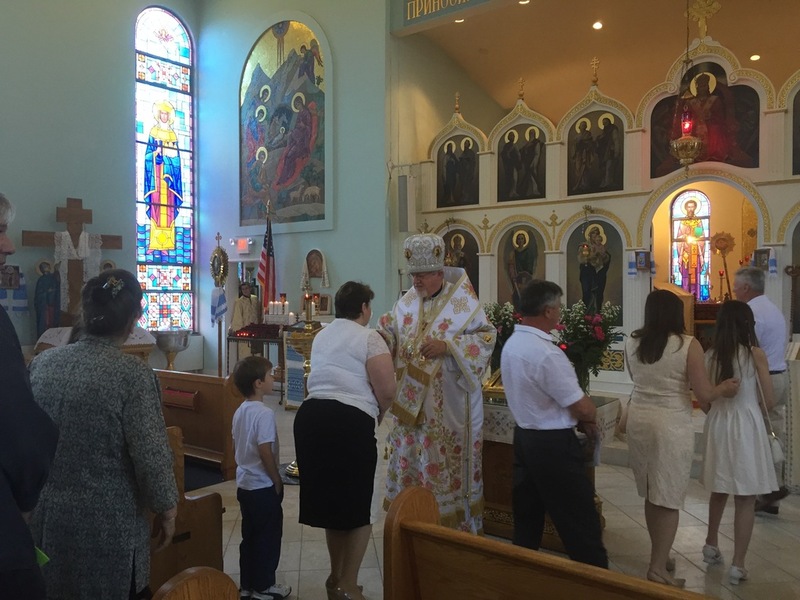 The Council of Bishops of the Ukrainian Orthodox Church of the USA recently created a new system of awards – “ordeny”, consisting of medals to be presented to the members of our UOC of USA parishes for service to the Lord above and beyond the norm. 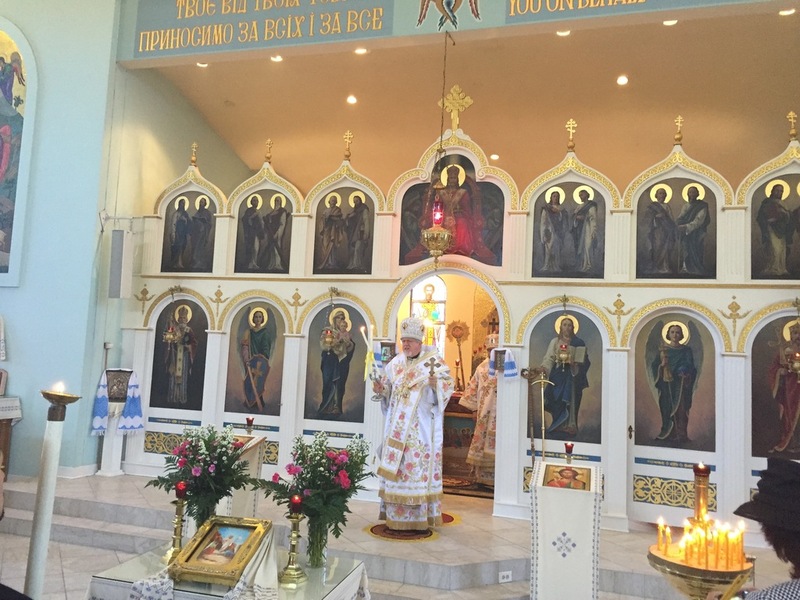 The awards include medals of St. Volodymyr – for outstanding service by a male; St. Olga – for outstanding service by a female; St. Petro Mohyla – for outstanding service on the cultural or academic level; St. Boris and Hlib for outstanding service in Christian charity activity; and St. Iov (Job) of Pochaev for outstanding spiritual activity. The bishops announced on this particular day that the very first in history of these awards were being presented. 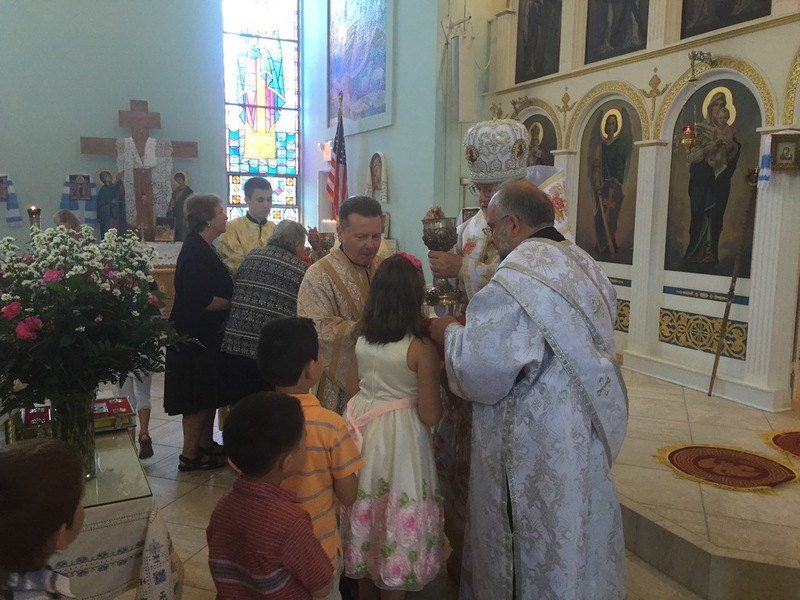 The award-“orden” of St. Volodymyr was presented to Ivan Prasko for his outstanding leadership of Pokrova parish throughout the nearly two decades as President of the Parish Board and most especially for his leadership during the last two years following the final tragedy that struck his parish family. 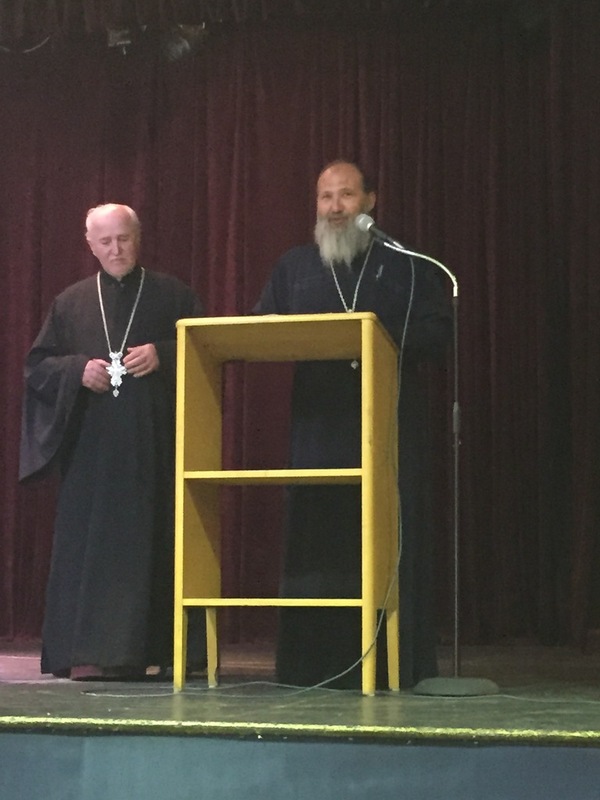 Metropolitan Antony expressed his personal gratitude to Ivan for his level headed and profoundly honest and fair concern for all during the difficult time when the decision had to be made to end the parish’s existence. 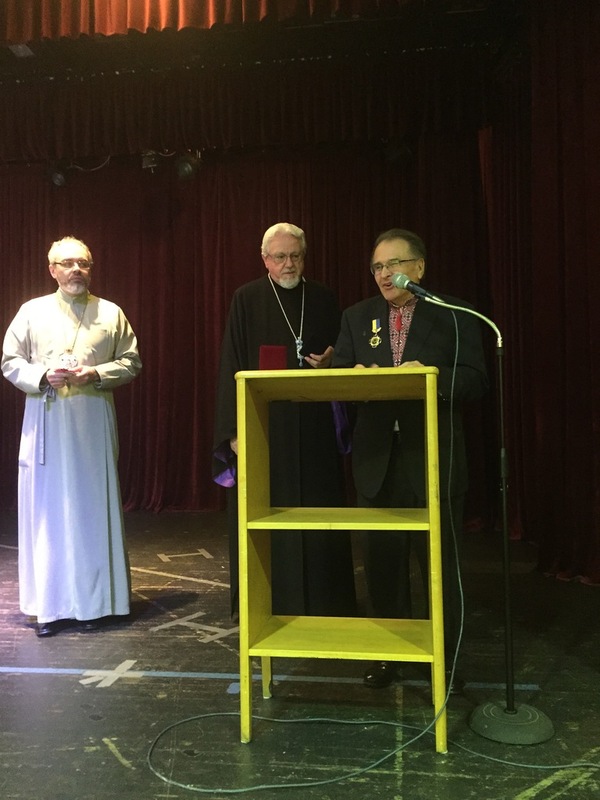 The second award-“orden” of St. Petro Mohyla was presented to Petro Hursky for his long service as Secretary of the Parish Board and his decades long service as Director of the parish choir, as the editor for several of the parishes anniversary books and overall cultural leadership of the parish, in particular ensuring that at each Parish Feast Day celebration a talk was presented for education and edification of those in attendance. 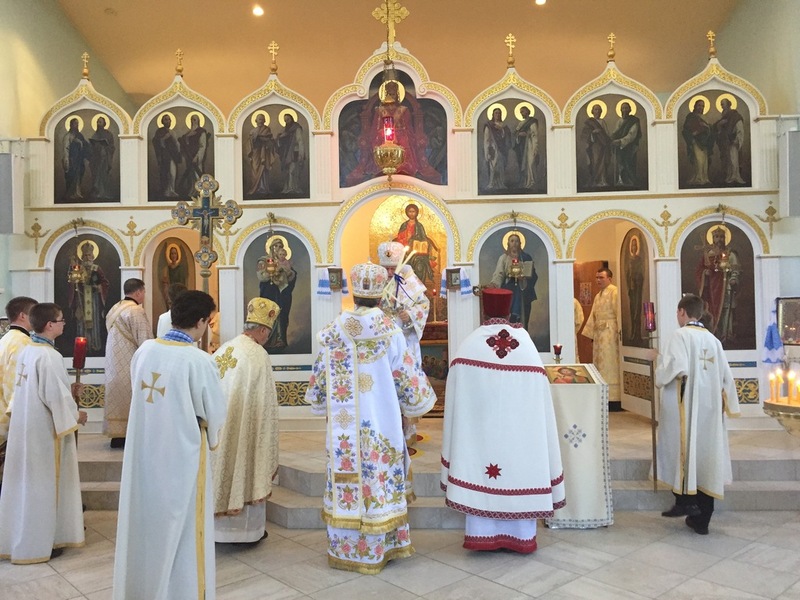 Metropolitan Antony explained that Petro was always very concerned that the history of the parish be accurately recorded – as secretary, editor of anniversary booklets and all other times – for posterity, so that future generations will know what their parents and grandparents accomplished. 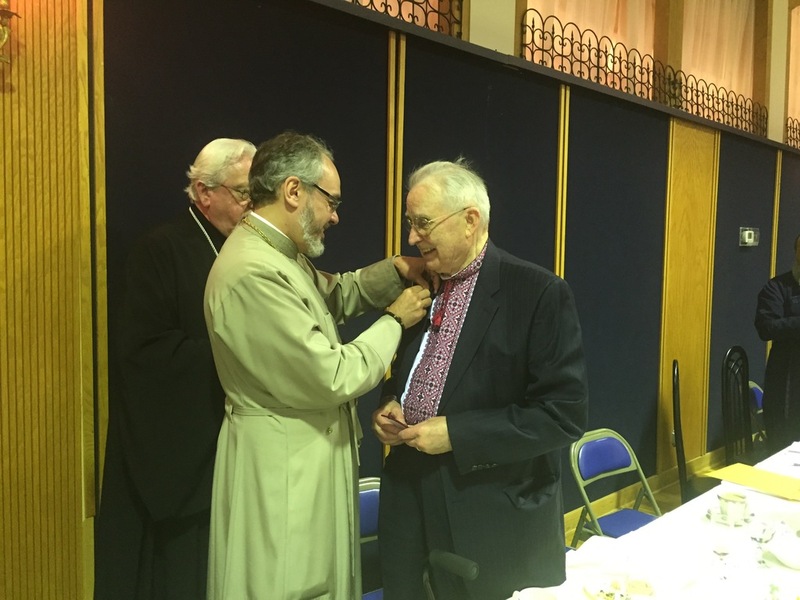 Bishop Daniel pinned the medals on to the lapels of the recipients as the nearly two hundred participants in the Unification Banquet rose to their feet giving standing ovations to these two recipients of the new awards. They each responded in shock that they were chosen for such special honors, but each called to mind the people that worked with them over the years to make parish life better and more successful. 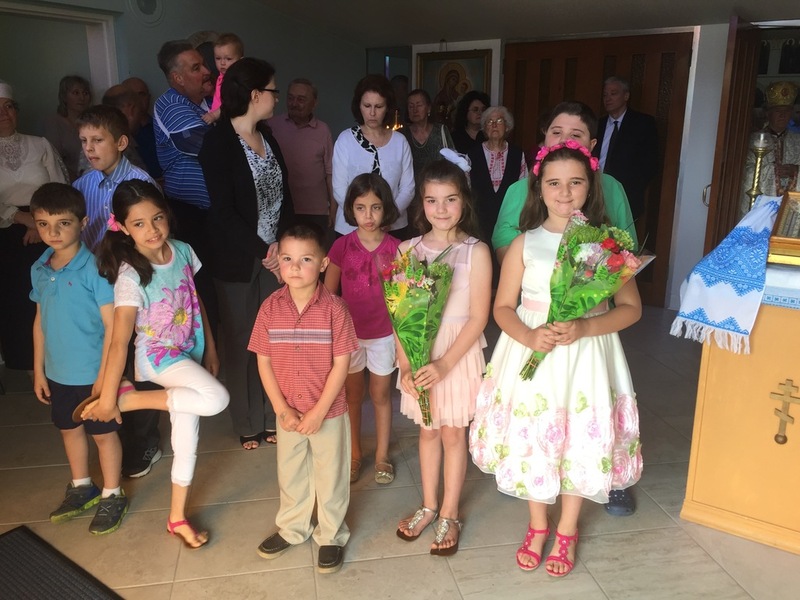 The balance of the program consisted of the presentation of sixteen gifts of love – the BLESSINGS resulting from the tragedy – to not-for-profit organizations from Pokrova parish funds combined with the funds received from the insurance company that protected Pokrova parish. 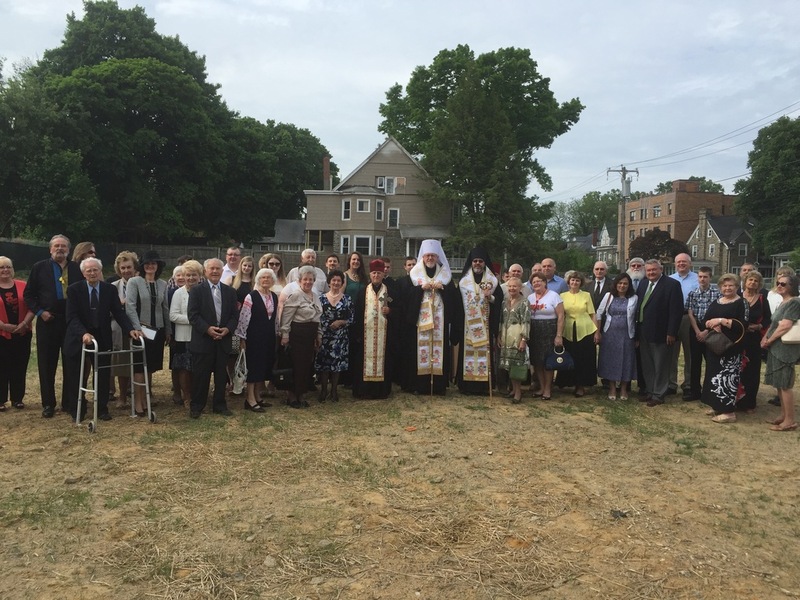 The recipients included: St. Vladimir Cathedral – receiving more than half the funds available; the Metropolitan Mstyslav Permanent Endowment Fund of the Ukrainian Orthodox Church of the USA; the Historical and Educational Complex and Museum of the UOC of USA; the Ukrainian Cultural Center of Philadelphia; the Aid to Ukraine Fund, UOC of USA; St. Andrew Society Ukrainian Aid Fund, UOC of USA; the Ukrainian Orthodox League of the USA Metropolitan John (Theodorovich) Seminarian Scholarship Fund, UOC of USA; the St. Sophia Seminary Library, UOC of USA; the Tryzub Ukrainian Sports Club of Philadelphia; the Ukrainian Radio Program, Ukrainian Cultural Center; the Shevchenko Scientific Society Encyclopedia Fund; the Ukrainian Free Academy of Science; the Bahriany Publishing Fund; the Ukrainian National Women’s League of the USA; the National Ukrainian American Veterans Memorial in St. Andrew Cemetery, South Bound Brook, NJ; and St. Michael Ukrainian Catholic Parish of Philadelphia, with which Pokrova Parish has had an enduring and close relationship throughout its existence. In addition to these gifts, a special fund was established for the restoration of the items rescued from the burned out Pokrova Church. 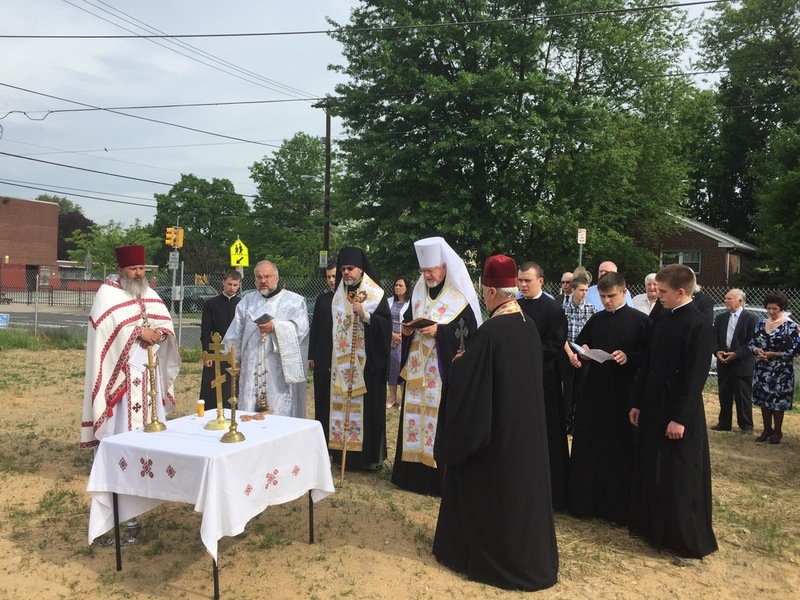 These items will be utilized in St. Vladimir Cathedral, St. Andrew Memorial Church, South Bound Brook, the Church Museum and in new mission parishes being developed around the USA to meet the spiritual needs of our faithful who have moved away from the traditional Ukrainian settlement areas. The representatives of the organizations listed above were overwhelmed by these unexpected blessings. 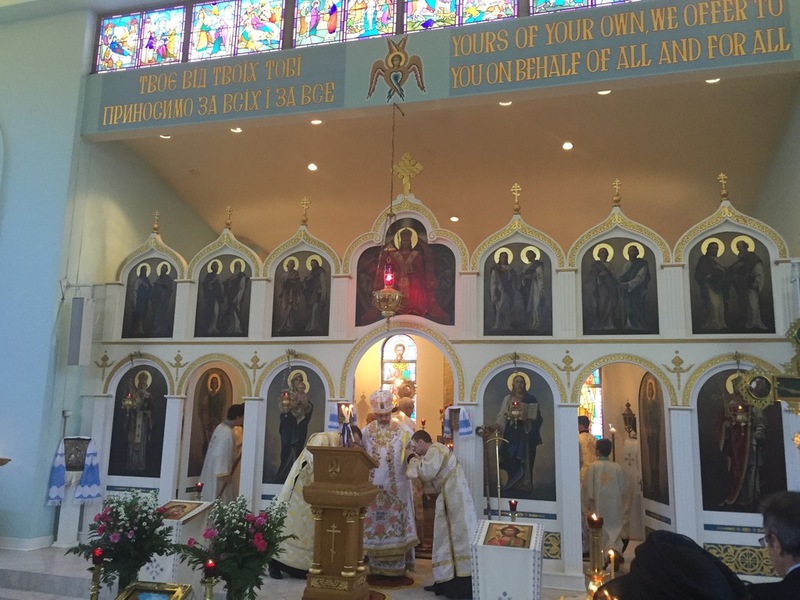 These gifts will serve as a living memorial of Pokrova Parish and all her membership throughout the 65 years of her existence. 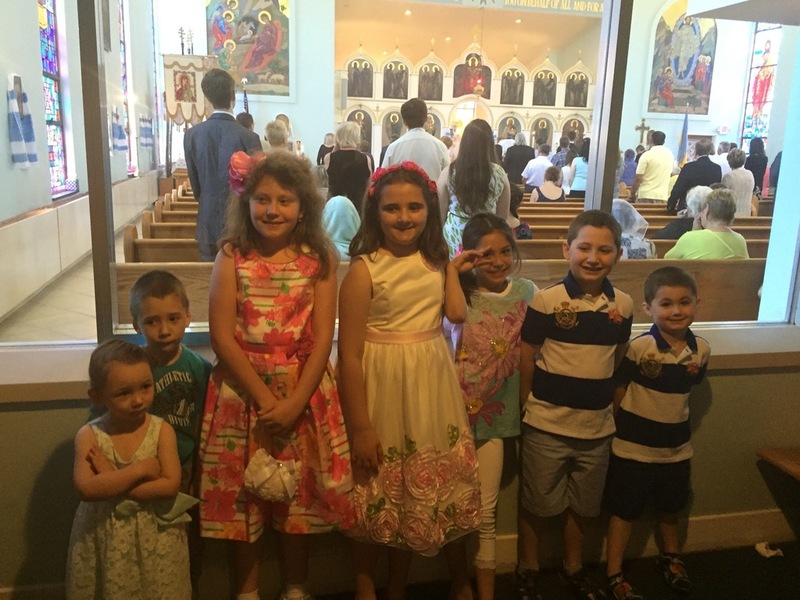 The members of all the receiving groups will forever call to mind the kindness and generosity of the faithful of Pokrova Parish. 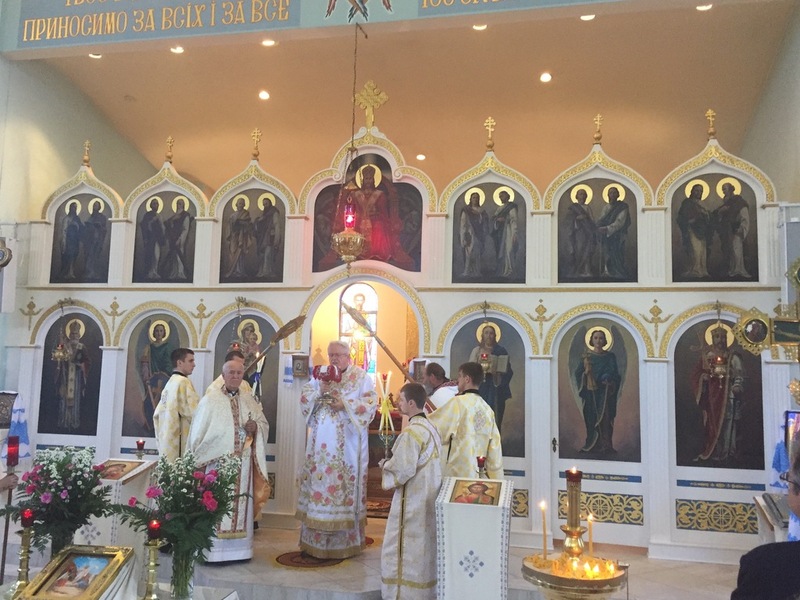 May the memory of those who have reposed live from generation to generation in God’s Heavenly Kingdom and may the gifts and talents of the remaining members work miracles in their new cathedral parish of St. Vladimir.